Not my usual color choices, one of the pieces for my Itty Bitty Valentine Swap partner who loves birds and dark colors. The itty bitty theme is for a tiny little 3 inch square, not a whole lot of space to do much but just enough to squeeze on this lovely piece of fabric featuring black velvet motif of birds. 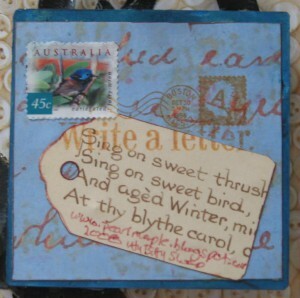 A tag cut from calligraphy text bird poem and a bit of mail art. Yowza!! You are working some awesome stuff, girl!! I love your blog banner!! That is truly beautiful and to do it on just 3x3in.. Wow! Wow this is quite exquisite! Beautiful work with just 3 little inches! Such a lovely project – I just love the colour! That is beautiful!! 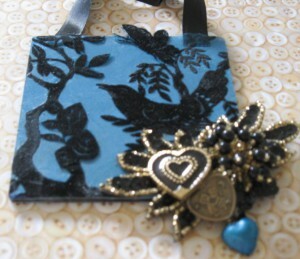 I love that blue velvet!